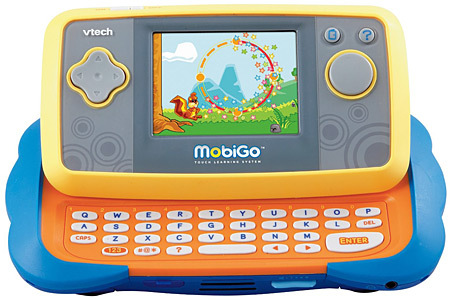 MobiGo touch play learn system from VTech. This electronic learning toy is the latest in this kind of product, whereby educators have informed the design of inputs and outputs that foster learning. An interactive learning device that uses a touchscreen and keyboard encourages learning and the development of dexterity skills. The MobiGo system brings modern handheld technology to the mission of teaching, whether it's addition, spelling, problem solving, or noticing the differences between similar objects. Download updates online.